In Geoscience, I regularly teach four undergraduate courses listed in the UConn Course Catalog. GSCI 4210 – Glacial Processes and Materials in course is taught every other spring semester in even years. This is a specialty elective beyond the geoscience core, and is cross-listed as a graduate course. GSCI 3020 – Earth Surface Processes is one of four courses in the geoscience core. It’s essentially a geomorphology course with a lab. Though I’m scheduled to teach it every fall semester, recently I’ve been pirated to develop other courses. GSCI 1055 – Geoscience and the American Landscape is the Honors version of introductory geoscience, and is the oldest course in the Honors Core. It’s taught every other fall (odd years) in rotation with another Honors Course in American Studies. GSCI 1051 Online – Earth’s Dynamic Planet is general introductory geology. I developed the online version as a way to enhance enrollment and to oversee the content. 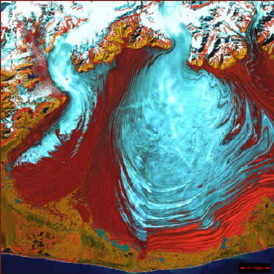 Photo: NASA aerial false-color image of the Malaspina Glacier, Alaska, which provides a good scale-analog for the lobes of the Laurentide Ice Sheet responsible for much of the southern New England landscape.